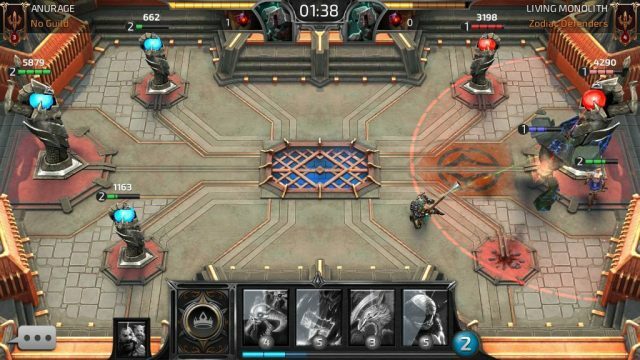 Rival Crimson X Chaos is a brilliant PVP arena strategy game that lets you fight human opponents in real-time matches. Unlike other mobile tower rush games, Rival lets you battle opponents in landscape mode, which looks fantastic on a mobile phone or tablet PC. Developers at Section did a tremendous job, especially in the graphics department. Ranged champions provide great support to tank units. Without them, it won’t be easy to quickly destroy a tower. My favorite is the Sniper-Golem combo. Using a Golem, you can target one of the two secondary towers and while he is at it, just drop the sniper a bit far away from the Golem, keeping his attack range in mind. He will automatically start attacking the tower if there are no other targets within his range. Together, this destructive team can demolish any building pretty quickly. Do note that snipers and other ranged units have lower health, so a melee unit or another sniper can easily take them out. While dragging a unit to the battle arena, you might have noticed the red line. This line divides the battleground into two deployable zones. You cannot drop a unit beyond the red line and this applies to your opponent also. However, dropping a champion just behind the line or on it will allow you to reach your target faster. You should deploy slow-moving demolishers and tanks just behind the red line so that they reach one of the two towers quickly. In fact, you should try this trick on most champions, irrespective of their speed, so that you can get to a weaker tower without wasting any time. However, you shouldn’t deploy ranged units, such as the sniper, close to the red line as the enemy will drop a spell or a melee unit on the same spot and this will kill your champion instantly. Rival Crimson X’s “Overdrive” mode begins when the battle timer hits 1:00. When this mode activates, the mana bar fills up faster than before, allowing you and your opponent to quickly deploy more number of units. Make sure to drop the most destructive units if you are going offensive or ranged units if you are defending a tower. Your opponent will also leave no stone unturned in deploying several units at once as the mana bar fills up really fast. Pay attention to your opponent’s moves and drop units as a response to his move. If you have already destroyed a tower, you can go full offensive when Overdrive kicks in. With one tower destroyed, you have occupied a part of your opponent’s deploy zone. Drop more units on the occupied territory to reach the main tower quickly. There are a few champions that inflict negative effect on your opponent’s champion. The one that comes to mind is “bombie”. This hideous creature runs towards his foes and explodes, dealing some damage and poisoning his enemies. A poisoned unit’s HP bar changes to purple and the health keeps reducing until the color changes to normal. 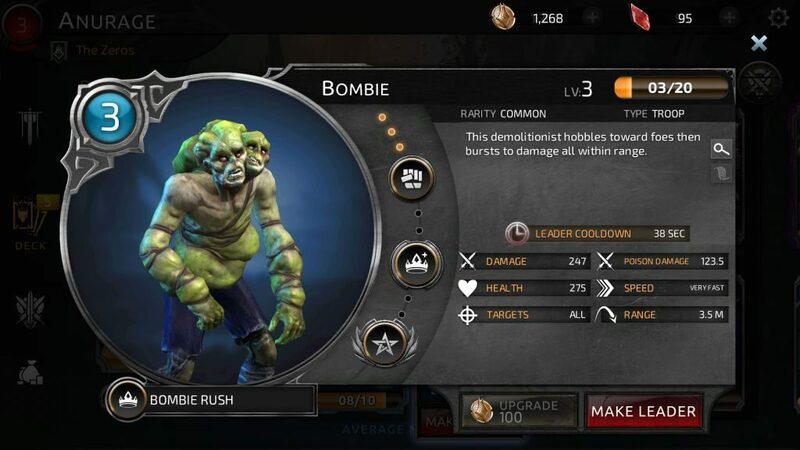 Bombie’s poison damage not only affects your opponent’s champions, but also towers. Make sure you drop this unit on an area crowded with enemies. Do this when you see a tank champion or a burly demolisher approaching a tower. Since a ranged champion can attack from a distance, you can be rest assured that he will stay put and attack when the tank unit comes within his range. Soon after placing a ranged champion, you can drop one of your tank champions in front of your opponent’s tank unit. While your tank champion attacks your opponent’s tank unit, the ranged unit placed behind the tower will also attack, but from a safe distance. Swarmers: They attack in groups and can be pretty effective against a solo champion. Armored Wolves, Skull Swarm and Hydra are a few examples of swarmer. Ranged: They attack from a distance and can be used to support tanks and demolitionists. You can also place behind a tower to defend it against brawlers and tanks. 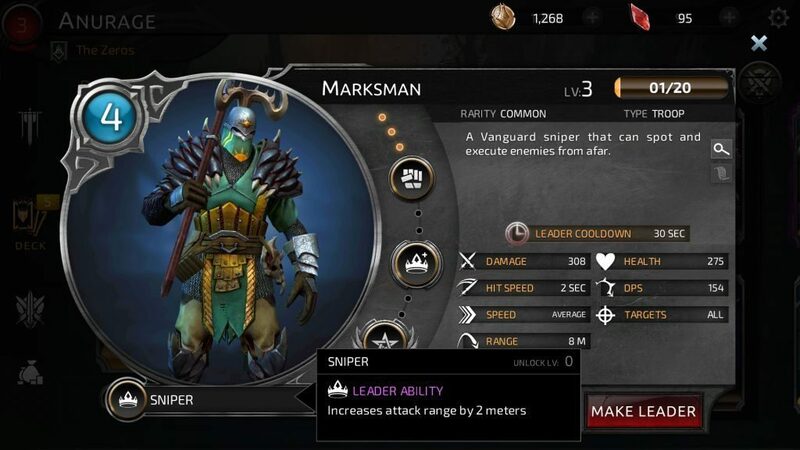 Marksman, Zealots, and Explosive Archer are ranged units. Tanks: They boast high HP and since it would take some effort to eliminate them, it would be better if you use them attack enemy towers or defend your towers. The Giant, Marauder and Grail Knight are key examples of Tank champions. Demolishers: These champions will attack only towers. Don’t forget to support a demolisher with a ranged champion to deal double damage to towers. Make sure you add stonecutter or Golem – two destructive demolishers – to your team. There are also spell cards such as spikes and meteor hammer. You will have to drop them on your opponent’s units to deal medium damage to them. Every champion has a unique ability that activates when you make him the leader of your pack. You can view a champion’s ability by tapping “Details” on his card. Under details, tap the name of his ability to know its effect and whether it’s passive or active skill. Certain champions, such as the Grail Knight posses both passive and active leader skills. 1. Win a PvP match. 2. Open free tomes that are available every 3 hours. 3. Unlock an “Arena Tome” by collecting 10 red obscura stones. You get an obscura stone when you destroy your opponent’s tower. The Arena tome option is not available every time. When the countdown timer is on, the stones you earned in PvP matches can’t be used to open one. When the time limit ends, you can start accumulating 10 stones to open the Arena Tome. I got the Giant champion from the arena tome. 4. Join a Guild. One of the biggest benefits of joining one is that you get a guild tome every 6 hours. Tap the “Social” icon on the left side of the screen to claim your guild tome. 5. Complete “Warrior’s Quest” to get a tome. Such quests have certain conditions, like winning 10 matches with Spikes card in your deck and so on. Tap the scroll icon on the bottom of the home screen to access quests. A champion has three skills, including a useful upgrade to his leader skill. You can unlock a skill by upgrading him to a certain level. Upgrading is fairly simple – you will have to collect a particular number of duplicate cards to level up his card. The card requirement increases every time a champion reaches a new level. The first skill of a champion unlocks pretty early. You can have a look at each champion’s skill and the level at which it will unlock by tapping his/her card and then tapping the skill icons located beside stats. Unlocking the first skill of each champion will definitely make it easy for you to eliminate opponent’s champion and destroy towers. In Rival Crimson X Chaos, a player can increase each tower’s health and damage by leveling-up. 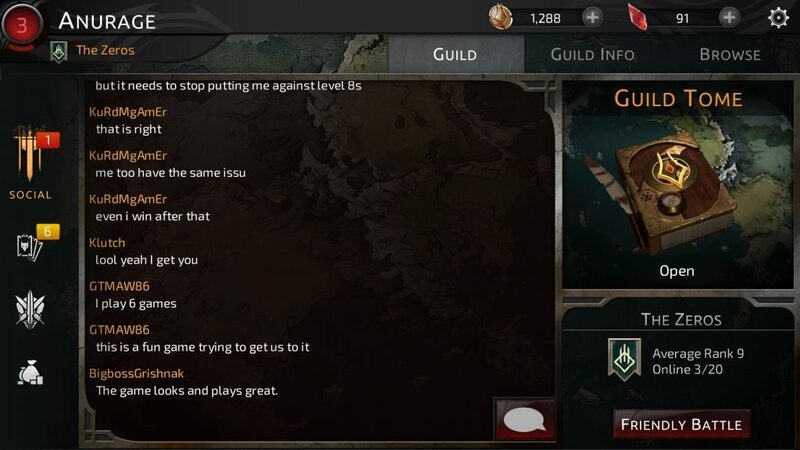 To do this, you will have to level-up champions. You earn EXP every time you upgrade a champion using duplicate cards. The XP bar on the upper left corner of the home screen shows how much XP you have earned so far. Once the bar is full, you level up and your tower health and damage also increases. You also unlock high tier cards.